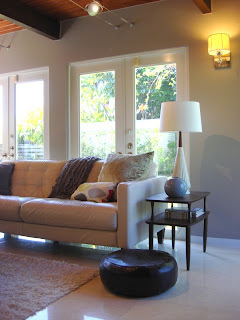 Our family room redo is what inspired this whole entire blog. It all started with these red chairs and my first ever Craigslist purchase of an arc lamp. I thought it was looking pretty good, but the more I looked and lived in the room, it felt boring and neutral. I've been slowly adding in some mid century pieces including this end table (gifted to me) and lamp (thrift store find) found in the picture below. I got my new pillows and I'm loving the colors. I bought this grey suede/linen pillow from West Elm. I had them in brown before and I love the feel of the suede. In the back corner, you can see my new 1956 record player cabinet turned toy chest and my garage sale print. The red vases may not stay there, they were engagement gifts from Crate and Barrel. I apologize for the poor lighting. This room has no window treatments and the glare and lighting is tough to photograph. Here's another angle of the back end of the family room. My husband is not too sure about my little cabinet. He says it doesn't match any of the wood in the family room...I had to remind him to look up. I love the warmth it adds. I am so tired of all of our espresso finishes. 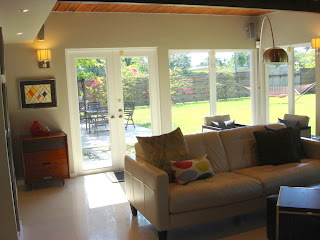 Here's the other side of our family room. You can see my sunburst mirror﻿ that I made using wood shims. 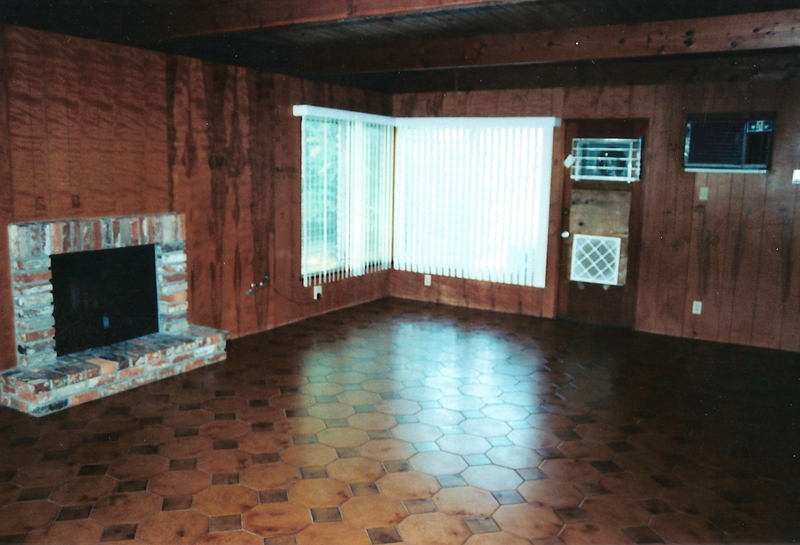 and just to remind you of what our family room looked like the day we bought our house. Crazy that it's the same place. What do you think? I'm loving the idea of having a bit more of a collected feel in the room, as opposed to everything off a shelf in a big store. I'm loving the warmth it has brought to the space and the color is fun. I think your living room is magic! And cannot BELIVE where you started from! Definitely love all of the pieces and accessories you have right now and love the idea of a collected look and mismatched furniture finishes, it gives the room life and character! Amazing transformation! xox! Wow, I'm blown away by the transformation of your living room! I think it looks fabulous. 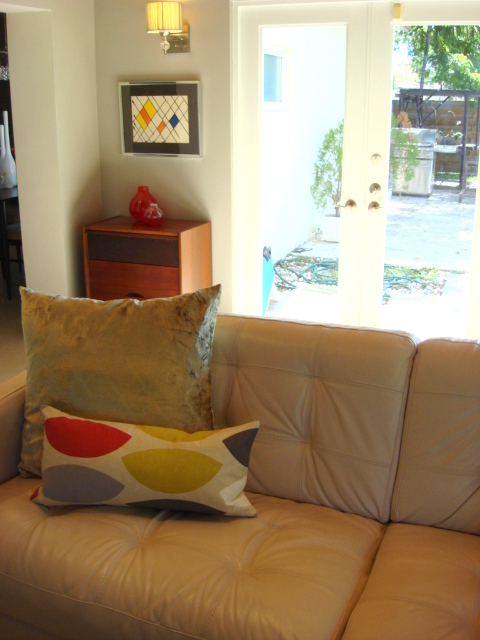 And I love mid-century pieces too. 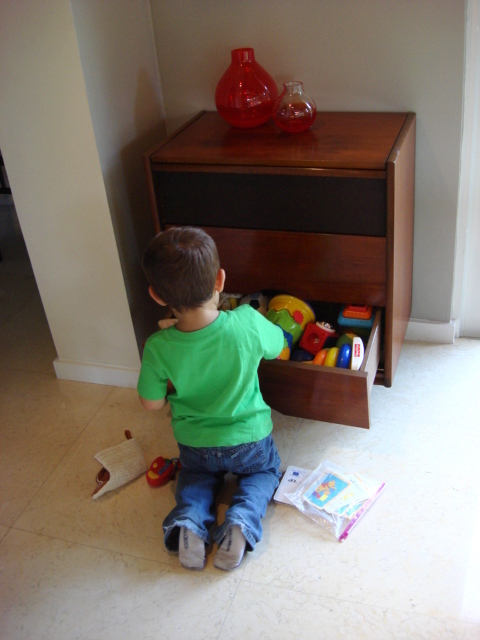 I hadn't thought of using an old stereo cabinet as a toy chest- I'll be keeping my eyes peeled for one! Your transformation is amazing. Your new space is so bright and beautiful. I love the exposed timbers. I am going to have myself some someday. It night not be for 5 years though. I like the little modern touches you added. You up to trying new things? I would try laying your throw over the back of the couch and down the front on wide side so it is a little wider. 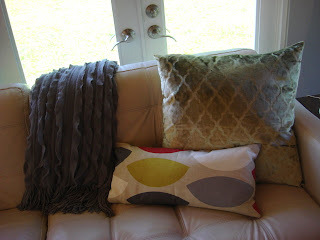 Then place just the suede and new print pillow in front of the throw. MAybe on the same end as your arc lamp (which I love). 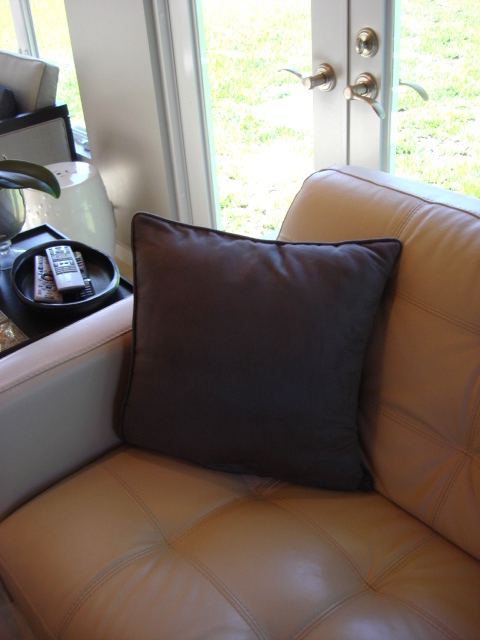 This off balanced arrangement might help keep the modern feel going on the couch. Not that your other arrangement doesn't look great as well. I just love trying little arrangements that I might not have thought of so I thought maybe you would too. I love all of the natural lighting in that room, pretty sure if I lived in your house I would spend all of my time in that room. Holy Guacamole, that is a transformation! Nice job girl! So airy and bright now. HAve a great weekend and Mama's Day! whoa, that's a lot of panelling in that before! i love the mid mod feel and the mix in wood tones. fabulous space! oh my gosh! the before is insane!! I looooove your ceilings!! beautiful home. I am jealous of those windows!!! You have certainly done a beautiful job from the before. That is one of the most extreme contrasts I've ever seen! I found you from Tatertos & Jello! Beautiful transformation! I love the pops of color and the toy chest is great. We live in a new construction home, so I always have such admiration for those of you who are renovating spaces. You've done a great job! Wow! Your room has come a long way. I am a fan of the collected feel. Now I have to go check out your mirror. Wow. That is such a wonderful transformation. I love your little cabinet! I don't think everything has to be matchy to look awesome :) Your sunburst mirror is freaking awesome and a great statement piece!! It looks fabulous! Very warm and inviting. Really looks great! 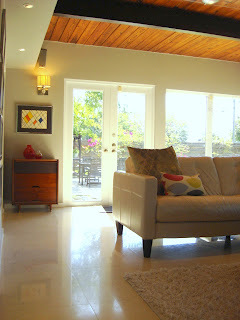 Wow your living room is stunning! I love all of your mid-century pieces. 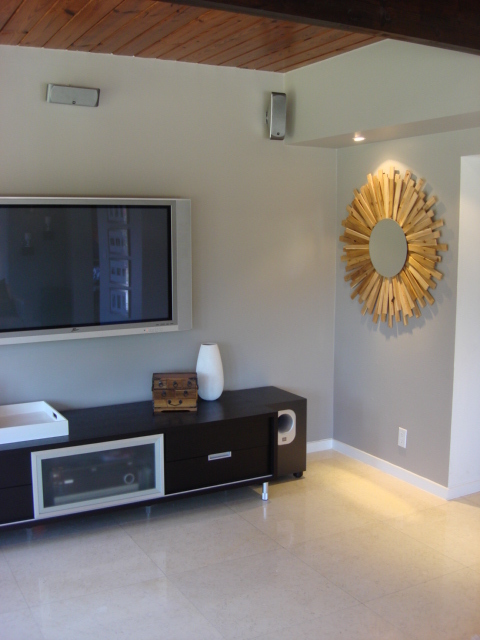 I think it is a good idea to mix wood species in a space, I think the little wood cabinet works perfectly. I am loving how open and light it is! It seems so calming. Great job and thanks for stopping by my blog! Wow, I NEVER would have guess that's the same room!!! What an absolute day and night transformation. 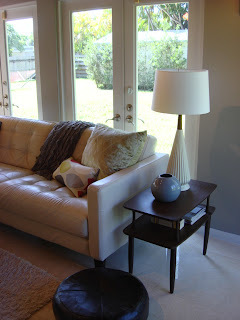 Love the end table and lamp. And your ceiling is gorgeous. Wow wow wow! What a transformation! Great job! ps- loving the new pillows!! agreed.. collected is much more exciting than big box 'staged' rooms. you did a great job!! That is a beautiful transformation! I really love your lamp! I am having a giveaway on my blog. A chance to win $27 store credit from Cmmoca's handmade shop to get a fabulous organizer! check it out! Your transformation is ridiculous! Great job!!! Love it!!!! I'm a happy new follower to your wonderful blog. Pop over for a visit and be sure to enter my giveaway! WOW! I can't believe the transformation! Way to go Chicka! I am featuring you on Spunky Junky so stop by and stay "Hi." Wow I adore that mirror and all of the great changes. Found you at Allison's!